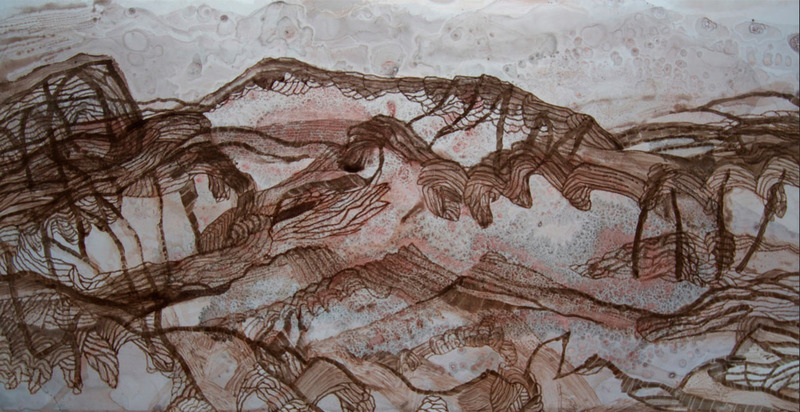 This body of work is the result of many years spent camping, walking and drawing in central Australia. Walking is pivotal to Booker's experience of the country. On his daily treks, the land takes shape like a map. Booker also studies satellite images of the area before and during his time on location. The work in this exhibition is site specific to the East MacDonnell Ranges, a couple of hours from Alice Springs. It’s the product of a two-week camp at Ross River in August followed by a couple of weeks in the studio. The smaller works were started on camp and finished in the studio. The four-metre long work was made after the trip using a satellite image of the terrain as a template. The works are resolved through a visual language that has been built up over years of drawing and observing the country. The contours of the landscape are a focus in these works; Ross Booker is mainly concerned with the line and light of the place. Everything starts with the line. The exhibition continues until 7 October 2016.